*optional 220SF bonus room and Legal Accessory Walk-Out Basement Apartment. All square footage amounts are approximate and some pictures are artistic renderings only. Your home at Sweet Woods will be set against a natural backdrop of heavily wooded splendor, on a private Belgium block-lined cul-de-sac. Each home sits on an estate like 3/4 acre setting, with wooded buffers and a natural preserve. In Colonial, Victorian and Post Modern stylings, the 4-5 bedroom homes offer the finest appointments and luxurious finishes, and can be customized to suit your exact preferences. Simply put, you will not find a finer home, in a more desirable location, to raise your family. 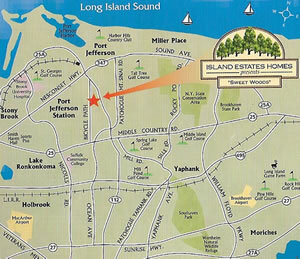 Sweet Woods, by Island Estates Homes, Long Island's finest new home community. "ENERGY STAR® qualified products and practices help you save money and reduce greenhouse gas emissions by meeting strict energy efficiency guidelines set by the U.S. EPA and U.S. DOE. The ENERGY STAR® label also designates superior energy performance in homes and buildings." HOME BUILDER PARTNERS: Island Estates Homes is a proud builder of ENERGY STAR® labeled homes.